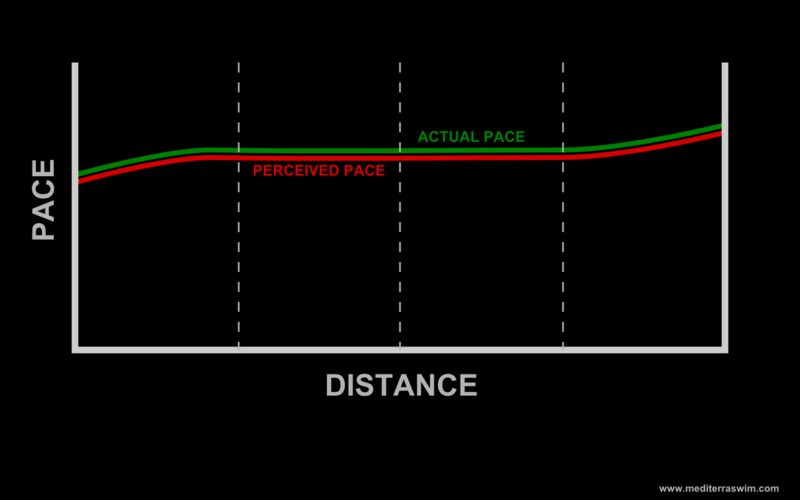 Training Pace Perception | Mediterra - Swim & Run Better Than Ever! 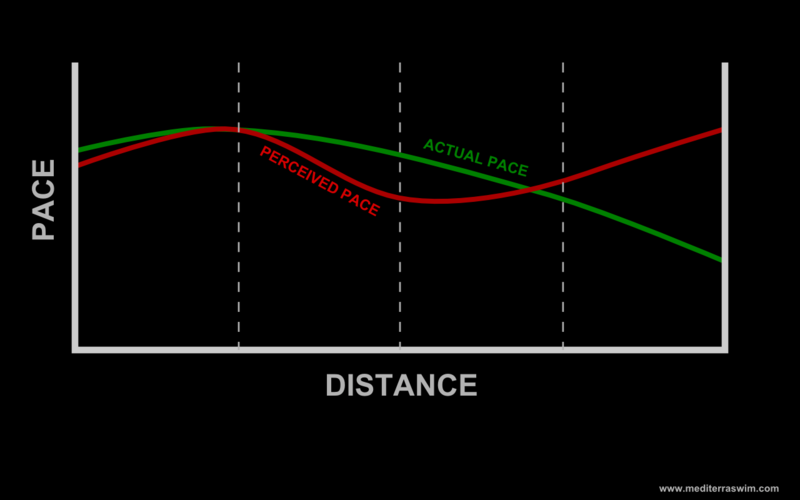 It may or may not be surprising to you to learn that holding consistent Pace is one of the most important skills for any swimmer desiring to race or accomplish a particular distance goal for the best possible outcome. This applies to 50 meters sprints to 1500 meters, pool or open-water, as well as any extreme distance you might want to swim. Pacing is about managing energy. You’ve only got so much to work with in various forms, and even over a long distance, you can only replenish it and burn it so fast. Pacing is a fairly universal principle in all activities involving the physics of energy and motion: throwing a baseball (or cricket ball, if you prefer); a vehicle racing around a track; a rocket blasting from earth to orbit. In swimming you’ve got a body that is using energy, and a brain that is managing it. Your mind gets involved because you’ve got to consciously feel how that energy is being used in the body and then make decisions how to adjust the burn-rate of the stroke at any given moment. You must do this not only to be able to finish the distance, but to be able to finish it in the best possible time (or optimal time, in the case of triathletes who need considerable energy to spare after the swim). That green line represents what happens generally to a swimmer’s pace over the distance of the swim. The red line represents what the swimmer’s brain thinks is happening to the pace over the distance of that swim! The green line is reality, the red line is perception. Just about any novice competitor has had this experience: blasting off in the collective adrenaline of the starting masses only to have a serious energy crash somewhere short of the finish line. The competitor had an overly optimistic perception in the beginning, but suddenly it shifted and warning lights started flashing too late. But in that starting moment, the under-developed perception of the novice only feels an endless abundance of ENERGY flowing through the arteries and so blasts away without realizing the doom he’s just condemned himself to. Transforming a novice to a seasoned athlete (in this respect) requires a re-calibration of perception: the athlete learns to interpret the sensations inside the body differently, to read the real story of what is happening to the energy within, then anticipate how it should be used, and then make pre-emptive decisions to distribute that energy wisely. Training with a Tempo Trainer in combination with Stroke Counting exposes this disparity between perception and reality and sets the stage for the re-calibration process. The disparity will be experienced both on short sprint work and in long distance. For several reasons I won’t go into right now, when swimming with a Tempo Trainer set to a consistent tempo (under a swimmer’s threshold tempo), and holding to a set Stroke Count, the mind will at one moment feel like the pace is too slow, and then at another section start to feel like the pace is too fast, and so on. If we remove Stroke Counting then what happens is the mind perceiving this push or pull of the Pace will adjust Stroke Length to keep within what feels like the same pace, but in reality is not. The mind starts following this wavering information instead of objective data. Stroke Counting is one of the objective tools we use to hold Tempo accountable to Pace. Pace depends on those two working together. In an under-developed perception if one of those measurements are removed from the relationship Pace loses its stability because the perception has lost its bearing. Though there are tricks that a swimmer can learn to estimate pace, tempo, and stroke length in the pool or open-water, ultimately we’ve got to learn to race without external measuring devices. The good news is that we, in fact, can develop a fairly accurate mental perception so that 1) what we perceive and what is reality are very closely aligned, and 2) we can shift the Gears of Tempo and Stroke Length on demand to set Pace without looking at a watch. Ideally, the swimmer’s perception will be trained to detect the actual pace accurately, and with good calculations of optimal pace, this swimmer will control the pace of the swim in such a way that she will reach the end in the best possible time with what energy is available to her. To test and calculate what the swimmer’s appropriate pace for the event should be. To train the body and brain to hold that consistent pace (or make planned shifts in pace) over the distance of the swim. To train the mind of the swimmer to perceive more accurately the actual pace, and to know consciously how to adjust actual pace according to the plan or the needs of the moment. If it helps to make an analogy: the body is the engine that burns fuel and generates power, the brain is the computer that monitors and controls these, and the mind is the pilot who needs to read the gauges and make decisions about how to tweak the controls. We need to train all three.